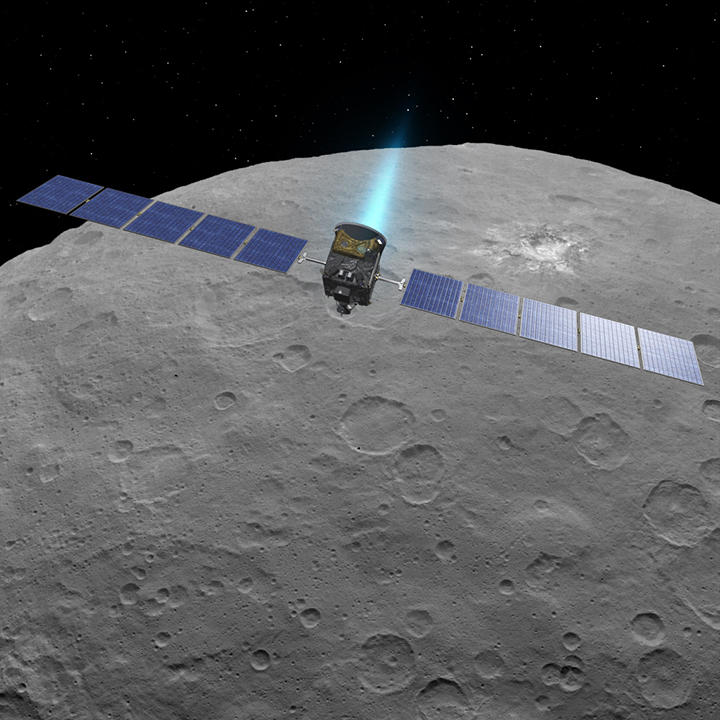 July 17, 2015 – NASA’s Dawn spacecraft is using its ion propulsion system to descend to its third mapping orbit at Ceres, and all systems are operating well. The spiral maneuvering over the next five weeks will take the spacecraft to an altitude of about 900 miles (less than 1,500 kilometers) above the dwarf planet. The spacecraft experienced a discrepancy in its expected orientation on June 30, triggering a safe mode. Engineers traced this anomaly to the mechanical gimbal system that swivels ion engine #3 to help control the spacecraft’s orientation during ion-thrusting. Dawn has three ion engines and uses only one at a time. Dawn’s engineering team switched to ion engine #2, which is mounted on a different gimbal, and conducted tests with it from July 14 to 16. They have confirmed that the spacecraft is ready to continue with the exploration of Ceres. By the end of the day on July 17, Dawn will have descended to an altitude of about 2,400 miles (3,900 kilometers). After arrival at its next mapping orbit — called the High-Altitude Mapping Orbit, or HAMO — in August, Dawn will begin taking images and other data at unprecedented resolution.